In our group we work a lot with diazotransfer reagents and diazomethane so I thought it might be a good idea to share some of our knowledge. These reaction involve reagents that are very dangerous and azide products can also be explosive so you shouldn't do any of this chemistry without being 100% sure you know what you are doing. However, if experiments are performed thoughtfully and with care the chemistry is predictable and well behaved. We are doing diazotransfer all the time these days to convert amino acids into azide derivatives. There are many reagents available for the diazotransfer reaction with the most common depicted in the figure below. We recently, published a review that gives a detailed description of the various diazotransfer reagents when used on amino acids but I believe it would be of interest to anyone attempting the conversion of an amine to an azide. Check it out here for the full story. The conclusion is that we favour reagents 4 that was developed by Goddard-Borger and Stick and first reported here. Later a safety update was published here followed by a comprehensive stability study that was published here. The problem is that the HCl salt of 4 is hygroscopic and when it becomes wet is starts to decompose forming hydrazoic acid (HN3) which is very nasty and totally unpredictable. Fortunately, it is easy to see when the decomposition has kicked in because the product turns into a black tar. The tetrafluoroborate and hydrogensulfate salts of 4 were found to be much better with respect to shelf life. In the future we will use the hydrogensulfate salt of 4, however, we have a big pile of the HCl salt we have to get through first. Fortunately, we discovered that rigorous drying of the HCl salt of 4 followed by storage at -20 oC makes it stable for >1 year. Anyway, if you are new to this stuff you should definitely go for the hydrogensulfate salt. Using the HCl salt of 4 we regularly synthesise amino acids with terminal azides in the side chain (see below). This is easily achieved from the corresponding amine (in this example lysine). The pH of the reaction has to be adjusted to approx. 8 to get it going. We normally insert a pH meter to keep an eye on things and simply adjust pH by adding sat. aq. NaHCO3 when required. The fantastic thing about this reaction is that the crude product is of such high purity that we never perform any chromatography but simply dry it and use it as it is. The synthesis of this particular azide has been reported many times in the literature. For a recent detailed procedure check out our SYNLETT paper on the synthesis of Fmoc-L-Lys(N3)-OH and a number of other azide and alkyne derivatised amino acids. Note that we are synthesising high molecular weight azides so these guys are not explosive. However, if you consider synthesising smaller azides please be aware that it isn't considered safe to handle azides with less than 6 heavy atoms per azido group (see our recent review for details). Some of you are probably thinking what is the mechanism for this reaction? Well I'll leave that to someone else to have a go at. I don't think the actual mechanism has been conclusively established and the suggested arrow pushing is rather exotic. 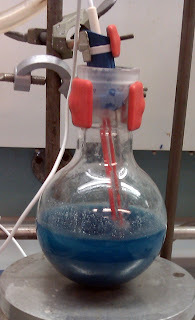 Suffice to say that it works and that nitrogen gets transferred from reagent to product without too much fuss. Have fun diazotransferring. D! 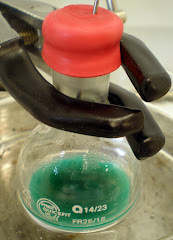 On a non-chemistry note I have started the blog Molt Bé, No? about Barcelona (and Catalonia). I spend a lot of time in Barcelona since my better half lives there and now I have started writing about our favourite spots. I find that guide books, news papers etc. are a disaster regarding their recommended restaurants, bars etc. so I thought I would do my bit to help visitors to Barcelona have a nice and authentic experience when visiting the Catalan capital (and the surrounding area). Check it out here if you are heading in that direction. D! How do you know they are not explosive? Have you carried out all the tests? Hammer test dropping, friction. What happens when they are heated? Do they undergo autocatalytic decomposition etc, etc. Show some thermal data such as DSC for your starting azides and the product azides. I love the diazo transfer reaction. C-H Wong has a great synth of TfN3 in solution that you make right before use. I used it with protected lysine, ornithine and a serine derivative to make a series of azides. Near quantitative conversions and isolated yields were also excellent. A great way to make azides! I agree with Dr Pedersen, high moleuclar weight azides are really nothing to be too concerned about, the nitrogen content is just so low that the energy required to initiate an exotherm or explosion is ridiculous and should not be encountered in day to day lab conditions. My azides were bench stable for multiple years; I feel the community is a bit to leery of nitrogenous compounds (I also made diazo compound intermediates using Arndt-Eistert conditions, and to my surprise these compounds were bench stable and do not decompose even after 6 years). I started using the imidazole-1-sulfonyl azide reagent a couple of years ago for making azido glucose derivatives. As it was considered safe I made a 100 g of it and kept on the shelf for months. Suddenly noticed it had turned into a gum. When I opened the bottle there was a lot of pressure released and an awful smell. I did not realise it was hydrazoic acid until later... We had had a big explosion of HN3 (1+ mol) upstairs a few years earlier that destroyed a whole lab (miraculously only one person had burns on his hands), so I was more than happy my reagent could be disposed without any further incident!!! Nowadays we limit it to 10 g scale batches as the intermediate chlorosulfonyl azide is considered extremely dangerous, heat and shock sensitive and detonates spontaneously in pure state with same explosive power as nitroglycerine (see J. Chem. Soc 1971 p 3191-5). Can anyone please suggest me that how can i make azide derivative of polysorbate 80 (Tween 80)?? For the commenter above me, this reaction is going to give you an azide compound if you are trying to do the transfer to a primary amine. Beilstein Journal of Organic Chemistry - Open Access!